Después del look con tacones que os enseñé el lunes, hoy toca un look casual, que llevé la semana pasada. No había llevado nunca una prenda con la inicial de mi nombre (bueno sí, quizás en la bata del colegio… pero de eso ya hace mucho) y me hizo gracia verla en una sudadera. 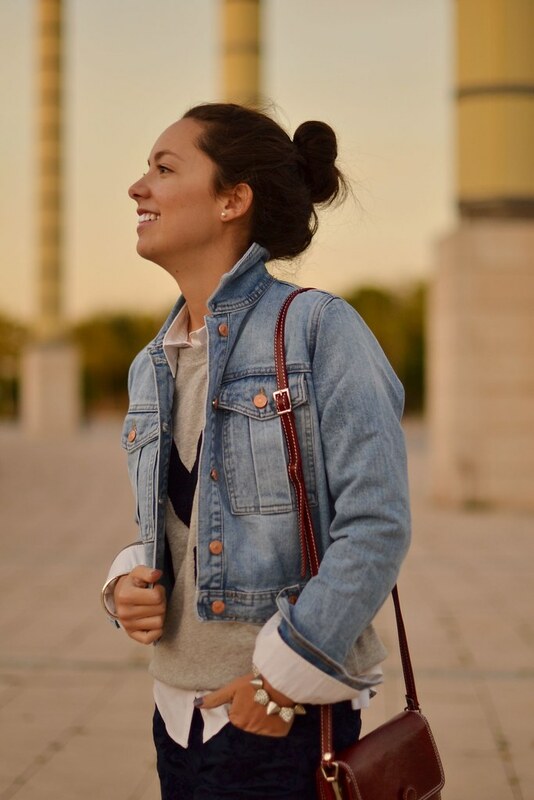 La combiné con una cazadora denim, pantalones con relieve y bolso de un mercadillo italiano de hace ya unos cuantos veranos (¡y está como el primer día!). Con lo que me gusta ir al cine, hoy voy a aprovechar la oferta de la Fiesta del cine y me iré con una amiga, pero aún no sabemos qué peli veremos ¿vosotras?¿tenéis pensado ir? A ver si os puedo enseñar en Facebook el look que voy a llevar…, que ya lo tengo en mente jejeje. página de: ‘Sobre mi’ del blog. ¿Os animáis? After the + formal outfit from Monday, here you’ve a casual one, which I wore the last week. I haven’t worn any garment with my first initial (well… yes… in my school smock… but that was a long time ago) and it was funny to see it in a sweatshirt. I mixed it with a denim jacket and a red purse from the Italian street markets from some years ago… and it’s like the 1st day. Oh! I think I’ve never told you that I like going to the cinema, so here in Spain from Monday ‘til today is supercheap, so I’ll go with my best friend. I’ll upload my outfit on my Facebook account… I’ve it in my mind ready to wear :). P.S: While I’m preparing the new layout, I want to include in my ‘About me’ page answers to your questions, doubts,… So ask me and I’ll pick 5 that most of you have asked me. Don’t be shy! I’d like to hear from you and know each other + than now.